This is the place where court reporters and students gain speed!! Click here for free speedup/slowdown extension for Google Chrome! Choose the one called Video Speed Controller. This is THE place to finally start improving your writing!! Anagram for "Mark Tod Kislingbury": "My kid, stroking a blur." Q&A: what did you WHA*U; what did he WHA*E; when did you WH*U; when did he WH*E; burgle PWURLG; burglar PWRURLG; burglary PWR-RLG; trailer TRAEURL; recovered RO*FRD; as well as SW-LZ; numerous TPHAOURPLS; did he tell you TKEFPLT. Lit: Kelly KAEL; debate TKAEBT; human HAOUPL; human being HAOUBG; I don't understand KWROPBD; beyond KWRO*PBD; like the HRAOEUBGT; like it HRAO*EUBGT; astronaut STPHAUT; space station SPAEUGS; gas station TKPWAGS; television station TW-GS. Struggling to improve? Court reporter or student? The Magnum Steno Club! Only $29.95 per month. Want a free one-week trial? Write Mark Kislingbury at to request one! Include your name, whether you are student or reporter, where you attend school (if any), and your current speed and goals. I'm Mark Kislingbury, and it's great to see you here! For Reporters and Captioners: To become the BEST you can be! For Students: To help you gain speed with faster fingers and shorter strokes! Second, we have the Magnum Steno Club! This amazing club costs only $29.95 a month, with no minimum, cancel any time. It provides hundreds of videos of me dictating three categories of videos: speed building, briefs, and instructional. Practice daily with me and quickly become one of the best reporters and captioners in the country. Check out the hundreds of testimonials for students and reporters alike! Call 713-837-6595 or write me at for a FREE one-week trial of the Magnum Steno Club! Third, I am presenting Magnum Steno Seminars around the country (each one is NCRA-approved or pending approval). In addition, I am available for personal consultations. I have helped hundreds via e-mail and telephone to resolve their problems and achieve their goals, at no charge. Also, I personally answer your e-mail questions. I'm here to help you! mark@magnumsteno.com. Call Jordane at 713-837-6595 or write her at ! Or write Mark personally an e-mail: . See you soon! 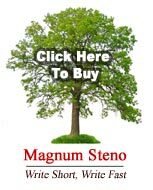 ATTENTION Students and previous customers, call in to get your DISCOUNT code when buying the Magnum Steno book! Are you a court reporter, captioner or student of either one of these careers and want to become better, faster, more accurate and the best writer you can be? Are you unsure what exactly is holding you back from writing faster and always keeping pace with the speaker, and unclear about how to become faster? Mark Kislingbury has a Guinness World Record in speed writing and is the fastest, shortest writer in the world. Mark is now sharing his speed building and short-writing techniques with court reporters, captioners and students around the world. He has the answers you are looking for to be able to write faster, shorter and take your career to the next level. If you truly want to become one of the best court reporters or captioners in the business, and are willing to practice diligently, you've come to the right place. The biggest problem that most reporters and students have when writing is in being able to get the speaker's words down as quickly, and as accurately, as possible. Mark has found that one of the most effective ways of improving your skills is to learn to 'write short', by using as many abbreviations, or 'briefs,' as possible. This reduces the number of key strokes you need to make, automatically giving you increased speed. Although many successful reporters and students use some briefs, they usually rely on fast fingers, or finger speed alone. However, their ultimate speed will always be limited by how many strokes they need to write. Fewer strokes means greater speed. Also, the continual writing of an excessive number of strokes is stressful and often contributes to hand, wrist, arm, shoulder, back, and/or neck problems from the repetitive strain. Reducing the average number of strokes per word written simply makes the job so much easier, less stressful and better for your health, and you will see yourself improve very quickly. Let's look at the mechanics of reporting spoken words in a court or lecture situation. As you listen to the speech, there are two factors that limit the speed and accuracy with which you can report them. The first is simply how fast your fingers are moving, or how many strokes you can make per second. You can train and practice speed building to make your fingers move faster, but there will always be an upper limit as to how many strokes you can achieve in one second, on a sustained basis. Secondly, you can abbreviate the words as much as possible, reducing the number of strokes you need per word, allowing you to get more words down without the fingers going faster. Mark has found that by working on both areas: increasing finger speed, and working diligently to shorten writing, you can achieve significantly higher speeds and easily keep up with even super fast speakers. More important, your realtime translation will become cleaner and thus your transcription time will but cut down, such that you will be making more money per hour. Mark Kislingbury is living proof that these skills can result in incredibly fast reporting. Mark has honed his skills to such a level, that in 2004, he set a new Guinness World Record for speed writing. For one minute, he wrote an amazing 360 words per minute, at 97.22% accuracy. (He made only ten errors in that one minute.) To do this, he combined great finger speed, an average 4.8 strokes per second, with dramatically abbreviated words: He used only 289 strokes for those 360 words, averaging 0.8 strokes per word. Many court reporters and captioners realize that these are areas in which they need to improve, but although they are willing to put in the time and effort to practice, they don't know exactly what they should do, nor how to approach speed building so as to be able to write faster and shorter. Without guidance from an expert and the right techniques, practice will unfortunately not produce the desired results. Many well-known techniques for writing faster and shorter only produce slight improvements or are ineffective, causing reporters and students to simply give up and fall back into their old habits. Mark is dedicated to sharing his revolutionary methods (which enabled him to clinch the world speed record, as well as win 11 NCRA speed and realtime contests since 1999) with his fellow reporters, captioners, CART writers, and students. He can teach you both how to train your fingers to move quicker, and how to reduce the number of strokes you need to get each word down accurately and combine strokes to record more shortened words at once. It seems amazing that such shortened words can allow extraordinary accuracy, but it's true. Mark's method will teach you how to memorize briefs for thousands of the most common words and phrases, enabling you, too, to achieve great speed. Mark personally guarantees that you can benefit from his methods. He is 100% certain that they will help anyone whose job or occupation involves having to quickly get down the spoken word, keeping up with the speaker at all times. 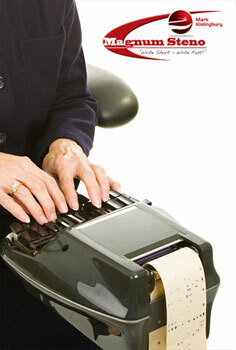 The Magnum Steno Club is the ideal place to begin your training and start writing faster today! First, there is Mark's book, 'Magnum Steno: Beginning Theory', his new 'Magnum Opus'. This book not only gives you details of all the short-writing techniques that make Mark a ground-breaking world record holder, but they also present them in such a way that you'll learn effortlessly, have plenty of material to practice with, and you will notice yourself being able to write shorter and faster almost immediately, the same day in many cases! Amazingly, this book is just what many people need for speed building! That's because writing short automatically confers speed. This incredibly detailed book is really the equivalent of a Master's Degree in writing short, and all returning customers (as well as students) receive a $50 discount. If you are more of a visual and aural learner who wants to be able to study and practice with direct video training and guidance from Mark, there is the 'Magnum Steno Club'. Just $29.95 per month gets you unlimited access to hundreds of videos Mark has painstakingly made about his methods and practice techniques, so you can study with new material every day, any time. Mark is so sure that you'll love the club, he'll even give you a week's free trial before you commit! Just email him at mark@magnumsteno.com, or give him a call today at 713-837-6595. Finally, Mark regularly gives personal seminars all around the country to select audiences of court reporters and captioners who are eager to learn and receive personalized advice. Just contact Mark for details of up-coming seminars. Whatever method of learning these revolutionary techniques you choose (Magnum Steno book, and/or Magnum Steno Club), Mark is personally committed to your success. He will always be available by email or telephone for personalized support. Let Magnum Steno and Guinness World Record holder Mark Kislingbury help you get writing shorter and faster today. Discover the great benefits that short writing could bring to your career. Your only regret will be that you didn't do it sooner!